Is recycling your household rubbish worth the effort? I can imagine the scene in many of your front hallways; a large buggy wrestles for space with the car seat and possibly a toddler bike or scooter. Piles of shoes overspill the shoe rack which was quite orderly before little ones started to toss them vaguely in its direction. The coat pegs are bulging and a trail of toys leads from the front hall to the kitchen where they spill out of the numerous toys sorter boxes which did once do the job efficiently. Life as the parent of little ones is difficult enough. I remember my friends telling me off because I would get stressed if the boys wanted to play with a new toy without putting the last one back. I had so many sorter units; one for each type of toy or set. My kitchen became more of a playroom, the principal being that the boys would play happily on the kitchen floor as I did the cooking. It was bad enough in my day to try to keep my kitchen tidy without the added trouble of several recycling bins and buckets. In London these days I have to sort my rubbish into 3 bins and a food waste bucket. In the country it is even more complicated. So where the hell are you supposed to put them all? Not to mention the nappies if you have a little one. It is a nightmare and you may be thinking that it is just not worth the effort. I had heard some rumours that it is all a total waste of time; we put all that effort into sorting but it all ends up in landfill anyway. This upset me so much. Landfill is so disgusting; we are polluting our land in a scary manner. But I’m so encouraged by what I have researched for this blog post. 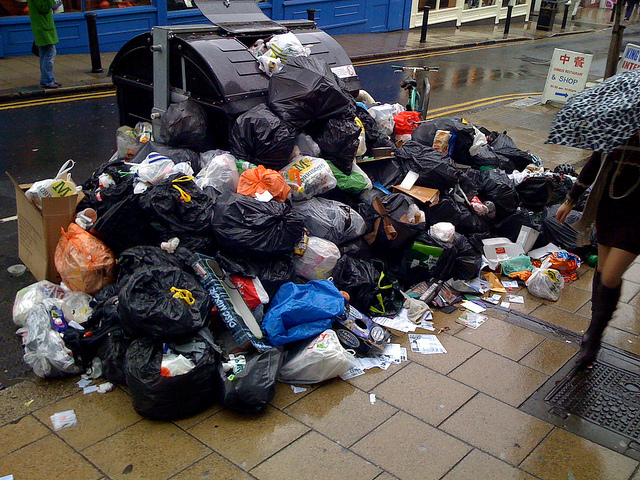 About 23 million tonnes of household waste is produced each year, which is about 10% of the UK total. We are currently recycling about 43% of that waste thanks to the irritating number of bins in our kitchens. And this is the point which makes it all very, very worthwhile – incredibly ten years ago we were only recycling about 7% of our rubbish. The EU target for 2020 is for countries to recycle 50% of their household rubbish. I’m so proud that our efforts really are working and we are well on the way to achieving that target PLUS the greenhouse gas emissions we produce from our rubbish have dropped by 70% in the past 15 years. At JoJo we do what we can. Our stores are targeted to recycle, we reuse packaging in our warehouse, and we install environmentally friendly lighting when possible. 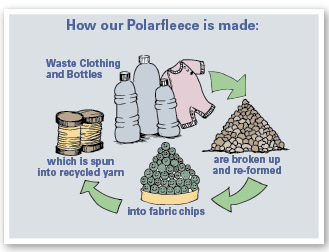 Much of our Polarfleece production is made from 100% recycled fibres (mostly plastic bottles), thereby offsetting our plastics production. We don’t try to be ‘tree huggers’ but we know what makes sense and we want to be proud of our ethics. We do what we can and believe in my frugal Mum’s favourite saying “Waste not, want not”. I know it’s a pain, but sorting and recycling our rubbish is such a great way of preserving the environment for our kids and theirs. If only our councils were being more proactive with disposable nappies. This country is shockingly negligent about what we do with them…I can see I will need another blog post to tackle that subject. I am always sorting the trash at home. I also teach my daughter to do it too and explain to her why. I think that it is very important to teach our children how to recycle. Thank you for the interesting information in this post! I believe that the majority of the population thinks, at least in their head, that recycling is a good idea. However, to actually stop throwing stuff away in the trash, and instead to take the extra steps necessary to recycle, can often be difficult. I didn’t always live what some call a “zero waste” life but I started recycling 7 years ago so that comes naturally. This process took more than a year and required a lot of effort.